"Wow! What a beautiful place!" How often have you heard that said about your gardens or the grounds of your workplace, school, park or sports ground? We have heard it quite a few times and here at Ricky Tyler Landscapes we are thrilled every time, because it means that we have done our job as professionals in grounds maintenance and commercial landscaping. We have the expertise and we have the equipment so whatever your needs - creative landscaping or general maintenance - we would be very happy to discuss them with you. 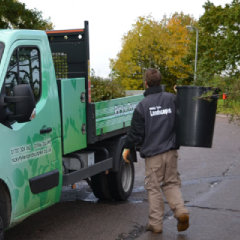 We work throughout Aylesbury and the surrounding smaller towns of Buckinghamshire, so you will no doubt have seen our commercial landscaping or our high grounds maintenance standards. As well as bringing our knowledge, at Ricky Taylor Landscapes we also bring environmental awareness and as much as anything else, we bring pride - ours and, ultimately, yours. Yes, we like to be creative but general maintenance is equally as important and our service aims to keep your grounds healthy and well cared for with a minimum of fuss. Ricky Taylor Landscapes is a professional team of experts in grounds maintenance and commercial landscaping and we are always fully aware that every inch of ground we attend to is a tribute to what we do and how well we do it. We enjoy our work and that is reflected in our costs. We think of your property as our own and provide the best while keeping within the economic boundaries of good sense. 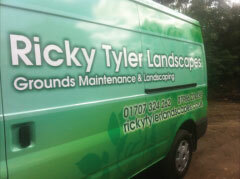 At Ricky Tyler Landscaping we think long-term and hope to enjoy a happy relationship with you. Our commercial landscaping and grounds maintenance is second to none as can be seen throughout Buckinghamshire both in Aylesbury and in the many surrounding smaller towns and villages, such as Stone, Stoke Mandeville, Waddesdon and Buckland. Our track record provides great grounds for the future. Ricky Tyler Landscapes can provide gardening and grounds maintenance services including Aylesbury Grounds Maintenance covering Aylesbury, Buckinghamshire .